Feedaway chair - making it easier to feed when away! Feedaway chair – making it easier to feed when away! I was fortunate enough to see the Belkiz Feedaway chair during it’s earlier phases on the ABC New Inventors television programme. At that time I thought what a genius idea this was, so it’s a great delight to announce that Feedaway will be launching and be available for purchase from mid December! Just in time for Christmas at Grandma’s house perhaps, or even a relaxing summer holiday away from home. Perfect for all things highchairs are useful for – without being an actual traditional highchair. 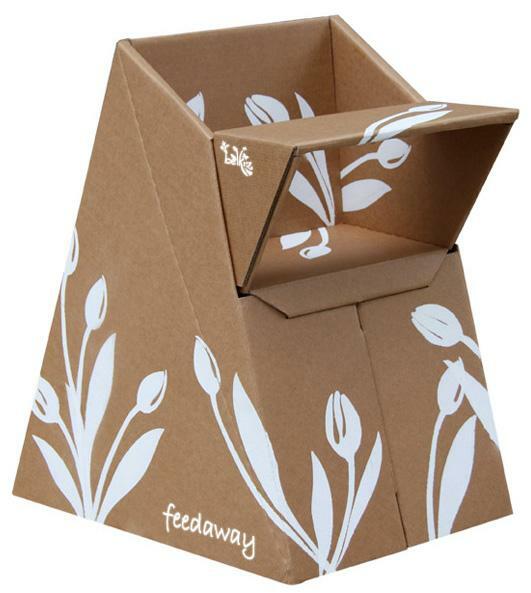 The Feedaway chair is made from recycled cardboard and folds flat into a box, perfect for travelling or places that don’t have room for a cumbersome highchair. The Feedaway chair isn’t a one-hit-wonder either – it can be used time and time again as it’s been cleverly coated in a non-toxic food grade coating, enabling it to be wiped down. Though it can be used many times, like all cardboard products, eventually it will need to be replaced. But this chair can be completely recycled which is fantastic for the environment! The Feedaway chair is designed for children aged up to twenty months or weighing up to twenty kilograms. It comes with a three point safety harness so there won’t be any little bodies climbing out! The Belkiz Feedaway chair will have a recommended retail price of $39.95. Pre-purchase yours now for a Christmas delivery – due to arrive at Styled Baby on December 18.